A few months back I blogged about URL shorteners and how great they are for a student's ability to access content that you want then to see on the web without having to type in long web addresses. I mentioned three of them: Google, TinyURL, and CiteBite. I like all three of those. The other day though I found a post about another URL shortener that could be a big help and possibly even bigger, because with Fur.ly you can create one URL that will open up more than once website via the "tabs" experience. This way if you are having your students research a specific topic like volcano types, then you can put your students on the trail of pre-approved websites and have them all open up at once. 2. Paste a URL into the first "Enter your URLs" text box. After you paste it another place for URLs will show up. Continue pasting all your URLs until they are all in there. 3. Fill in the Captcha and then click the "Go" button. This will now generate your new URL that contains all of the website you want your students to visit. 4. Copy the URL that is created or click the "Try it" link. 5. Your students will now see an orange bar at the top of their browser. From here they can cycle through the different websites by clicking the "Arrow" buttons or clicking on the "Down arrow" to get a list of sites. Fur.ly should save your students and yourself some time and frustration when needing to see pre-approved websites. Below is a video demonstrating the process. 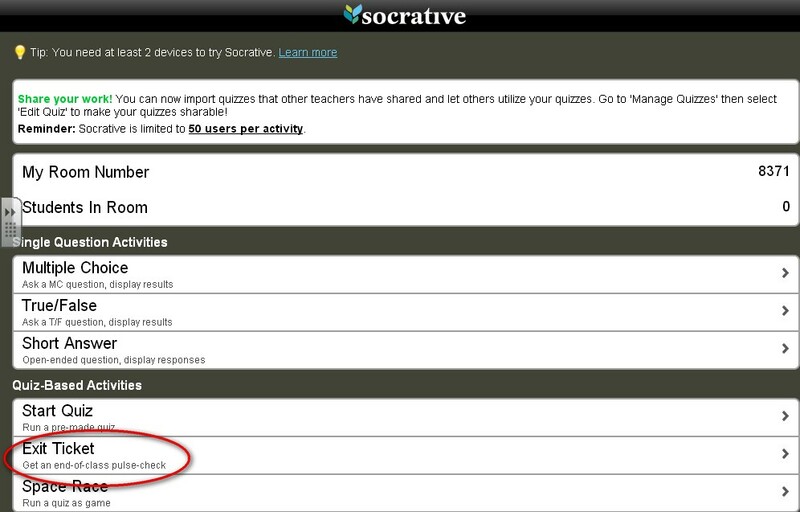 Socrative is a great tool to use for classroom quizzes and for getting feedback from students. Socrative has recently updated the exit ticket on the site. 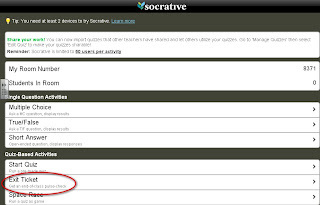 Have your students log in to Socrative, give them the room number, and have them complete the questions. After the class is finished the teacher can click "End Activity" and download a report in Excel format. The report can also be e-mailed to the teacher. If you want to make up your own questions for an exit ticket, do it as a quiz and then run that instead of the default exit ticket. Moodle: Disable chat/messaging within Moodle. This topic has actually been a debate among teachers in my district. Do we disable the ability for students to chat/IM/Message/Blog? My answer of course it "No." I know that it can be risky allowing students to use means of communication but with all the texting and cell phones they have, one more method isn't going to matter. Chatting and messaging within Moodle is nothing more than what students used to do in the old days; pass notes. The upside to Moodle messaging is that now you have a record of what kids are saying about and to teachers and peers. Where as notes and texting is harder to keep a record of. I happen to love the ability for students to use the Moodle messaging system, but if you are still not convinced or your school has a policy against it then the following tutorial will demonstrate how to disable Moodle's ability to message. 1. First in order to disable the use of chat or the messaging system within Moodle you need to be an administrator or the specific rights to play around with settings. 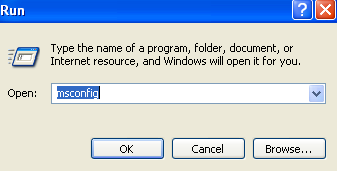 If your administrator doesn't know how to disable it then just send him a link to this blog post. 2. Log into moodle as an administrator. 3. Under "Site Administration" click on the "Security" folder and then choose "Site policies." 4. Now just scroll down until you see the "Enable messaging system" check box. Un-check it and you are all set. Don't forget to hit the "Save changes" button all the way at the bottom. 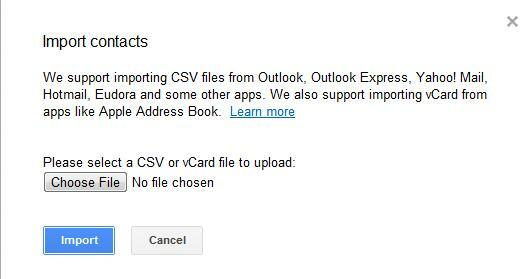 Google Drive: How do I send a document from Google Drive as an attachment via email. There are a few different methods of getting documents from your Google Drive into your email so that you can send them as an attachment. The following method is probably the easiest and most used. 1. Log into your Google Drive/Docs and open the document that you would like to send to somebody. 2. Click on "File" and choose the "Email as attachment" option. 3. Another dialogue box should then appear giving you the options similar to those you would get with most email programs. Just fill in the "To" with the contact you are going to send your file to. Type in a "Subject" and a "Message". 3. Before you send your file though make sure you choose from the drop down menu the file type you would like to send it as. 4. Once you are all done with steps 1, 2, and 3 click the "Send" button. This tutorial is for those school districts using the new FamilyLink option as their method of allowing parents and students to view grades. One of the number one reasons why students cannot view your grades is because you need to set the date range up each year or semester depending on how you want things to run. 1. Log into your SchoolMaster gradebook. 2. Click on the Web menu and then choose the "FamilyLink Setup..." option. 3. Click on the "Date Range" button. 4. Choose the dates for which you want parents to be able to view then click OK.
5. Click OK one more time, and you are now all set. Your students should now be able to view grades from your class. For those of you who have just started teaching the new school year, or are getting ready to, here are some educational tools and ideas for you to create a virtual environment for your students and parents that will enable you to have better communication throughout the year. I find that having a site that your students can go to to find information and get resources needed to better understand school content is very valuable. This tutorial will demonstrate how to create a Google website that can be used to post resources and other information for your K-12 classroom. Every class should have a calendar that is visible online so that your students can view due dates of assignments and tests coming up. It also allows for parents to keep better track of their students educational lives. This tutorial will demonstrate how to create multiple class calendars that can be visible online. After you have created class calendars you need an easy method for your students to locate it and other information. What better place to accomplish that than embedding the Google calendar into your website. This tutorial will show you how. Have you ever had an embarrassing ad pop up while browsing the internet with your students. If you browse with Google Chrome you can install an add-on that will block those ads from being visible. Have you installed Notebook 11 and noticed the "Smart-Ink" tab on every window that you open. Some teachers have express an annoyance with it so this tutorial will show you how to turn it off. Sometimes when creating webpages you want to make an image clickable so that when your users click the image it will go to another page on your site or an external URL. Below is a tutorial on how to accomplish this. 1. Login to your google site page that you plan on editing. 2. Once you are on the page, click the "Edit" icon that looks like a pencil. 3. Now we want to add the image that we will add to the page. To do that we will click on "Insert and choose the "Image" option. 4. If your image is located on your computer then click the "Choose File" or if you are using an image from the internet click the "Web address (URL)" option. In this tutorial I will be picking a file I already have on my computer. 5. Navigate to your image, select it, and then click the open button. 6. If a link already exists as did mine, just click the "Remove" link so that you can add a new one, or if you already know what the link is then click "Change" and you will save yourself a couple of mouse clicks. 7. If your image didn't have a link already then just highlight it by moving your mouse while holding the left click on your mouse. It should change to a different color to let you know it is now highlighted. 8. Once it is highlighted click the "Link" icon on your tool bar that looks like a chain link. 9. Now we need to decide where we are linking the image too. On the left side we have "Sites page", "Web address, and Apps Script. I would completely ignore Apps Script. If you are linking the image to another page on your site, just find that site using the directory tree on the right. If you want to link to an external website, one that you didn't create, then just click the Web Address option and then paste or type in the correct web address. Click the "OK" button, once you are done. 10. Once you are done with your edits and adding the link, just click the save button on your page and you are all set. I thought I would start a new idea this week on the Education in the Cloud with Web 2.0 Tools. I am going to start a series called "In Case you Missed it." This set of blog posts will review some of the posts that I have already made and allow you to get a brief summary of what the post entailed. This quick tutorial will demonstrate how to take an exported GMail CSV file and import it into your own Gmail contacts list. Google Sites: Fly out Menu. For those using Google Sites as your class webpage solution, on this post you will be taught how to create flyout menus that you commonly see on other sites. Flyout Menus are those tabs on a web page that when you hover your mouse over them you see new options appear. Smartboard: Create a study game that resembles a board game. I found this idea on Youtube and adapted it to my own needs. For those teachers using Smartboard in the classroom, this game can be an easy addition to a lesson on which you would like to improve. Create research citations and works cited pages using a Citation Wizard. This online citation wizard is extremely easy to use and will do both APA and MLA style citations. Create a virtual corkboard/presentation using Spaaze. Spaaze is a web 2.0 tool that educators and their students can use to present information. Spaaze give the user another means and opportunity to present. Google Contacts: Import contacts from somebody else. It is that time of year when educators across the country are trying to get ready for the new school year. 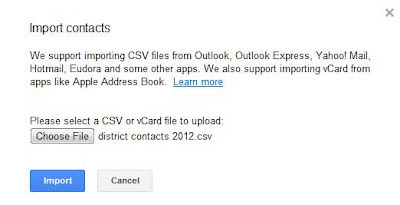 If you are new to a district and your district is using Google Apps for Education as their email and document collaboration solution, then you may want to get the contacts imported from a colleague who has been teaching longer. 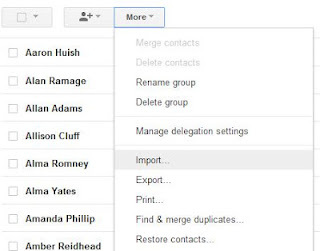 Below is a tutorial on how to import Google contacts into your own contact list. If you currently have some of the contacts from the imported list, then no problem. You will be able to merge both lists and names in just a couple of clicks and that is part of the tutorial as well. 1. 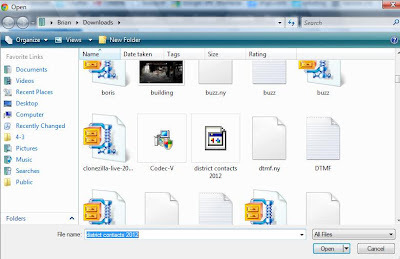 First this tutorial is based on the idea that your colleague has already exported their contacts. Once they have exported their contacts have them email you the file that they saved. 2. 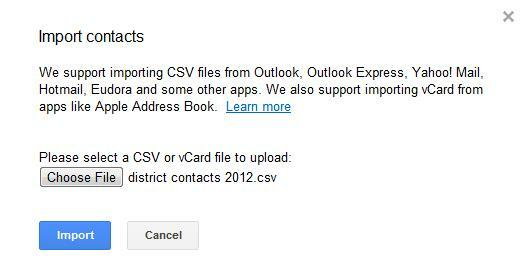 After you have logged into your Google Apps you need to click on the "Contacts" at the top of your screen. 3. Once you are on your own Contacts page, click the "More" button and then choose the "Import" option. 4. 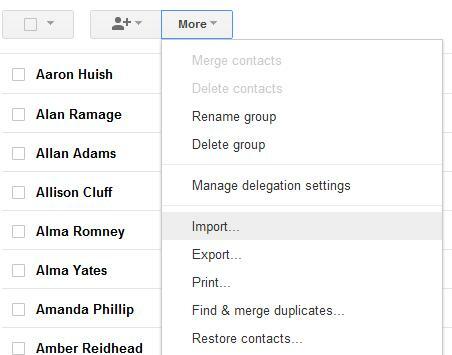 Click the "Choose File" button and navigate to where you save the Google Contacts file that was emailed to you by a colleague. 6. Now click the "Import" button. 7. Now if you aren't new to the district and you already have contacts on your contact page then you need to "Merge" the duplicates. 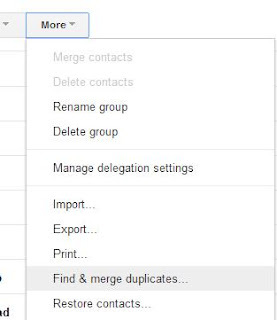 Just click the "More" button and then the "find and Merge duplicates" option. 8. 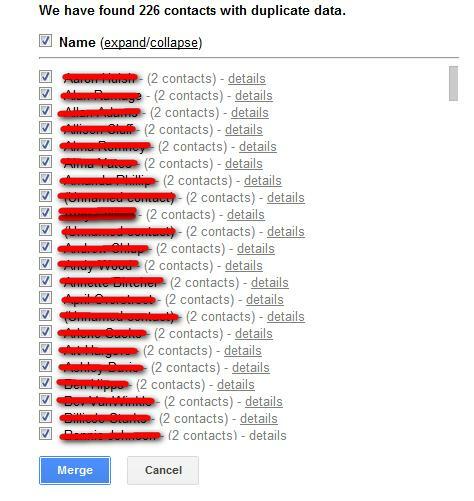 You will then be shown all contacts that have duplicates. Just click the "Merge" button.